Do you ever dream of a secluded retreat in the country, perched high atop a hill and surrounded by stunning scenery? Well then this extraordinary dwelling with provide plenty of inspiration, with its stone facade and wooden architectural augmentations showcasing an amazing design, that beautifully blends historical and modern style. 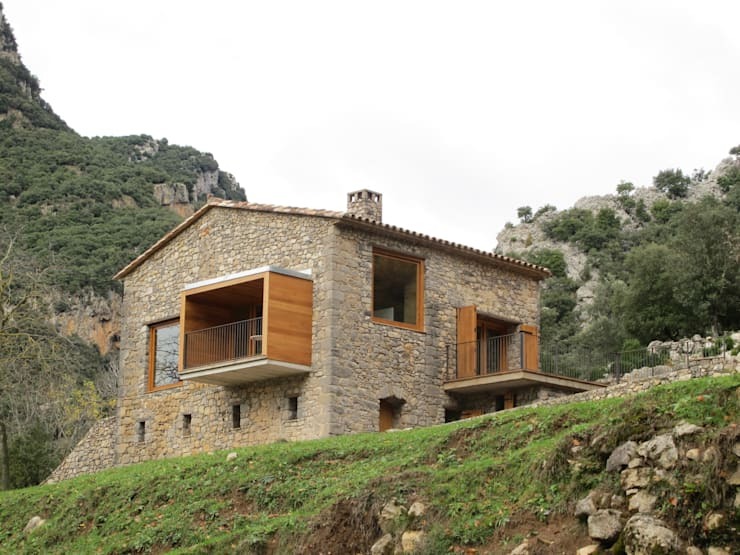 Brought to use by the creatives at Spanish architecture firm, Arcadi Pla i Masmiquel, the home rises up amidst its gorgeous, mountainous surrounds, with its high, stone walls resting on an impressive, aged foundation. Inside, the abode has been dressed in decor of soft timber, with woodgrain flowing across its walls and ceilings and even prevailing throughout the home's furnishings. Ample windows have been included to provide multiple vantages from which to admire the surrounding view, while a cosy balcony and expansive deck have also been constructed to accommodate outdoor living. This home will definitely inspire a daydream or two—take a tour below and tell us how you would decorate the interior! 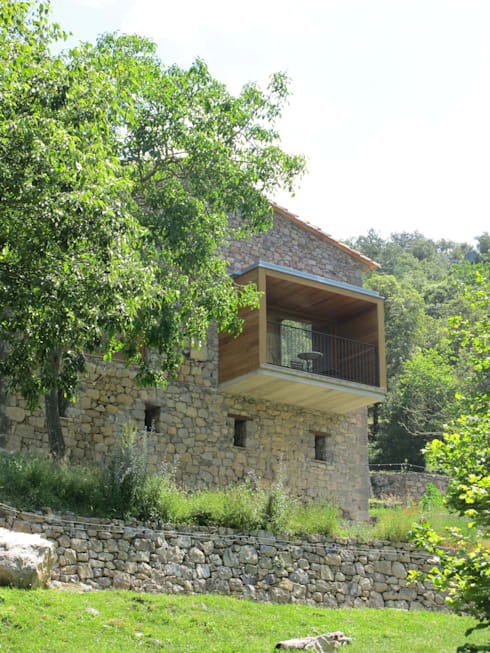 This facade of this unique home has been constructed of a beautiful blend of old and new materials, with the rough texture of its historical, stone walls having been augmented by a more modern array of smooth, wooden finishes. Doors, window frames, a small balcony and an expansive deck have been added, infusing the home's historical air with a sense of modern style and comfort. The use of wood creates a pleasing contrast of colour and material, while paying homage to the dwelling's remote, rural surrounds. The foundations of this home are impressively built, and also combine historical and modern architecture to ensure a solid base atop a relatively steep hillside. 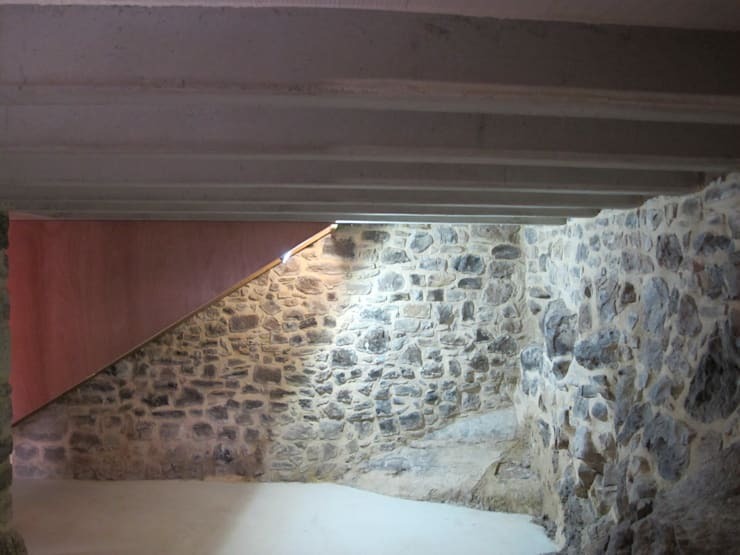 Here we can see the original foundations of the building have been reinforced by reams of concrete, while its wooden augmentations have been built down to the foundation to ensure their stability. 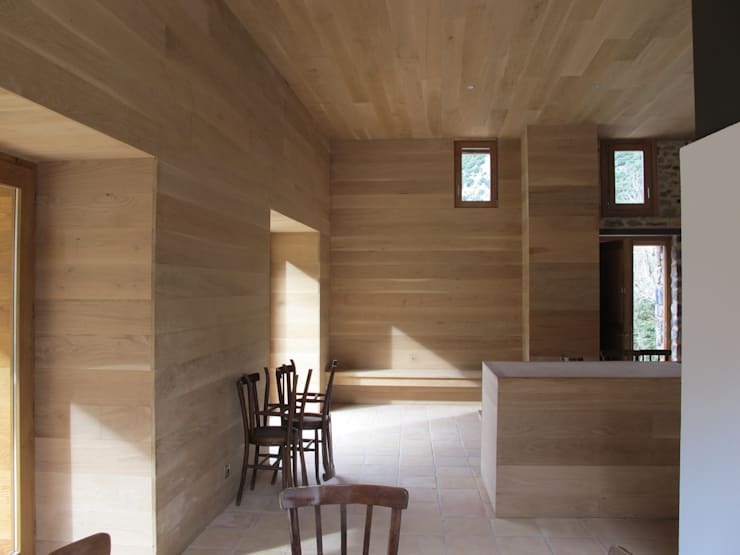 Moving through to the home's interior and we're embraced by an open and airy space finished in pale timber. The soft tone of woodgrain flows around to create a warm atmosphere filled with modern, country charm. 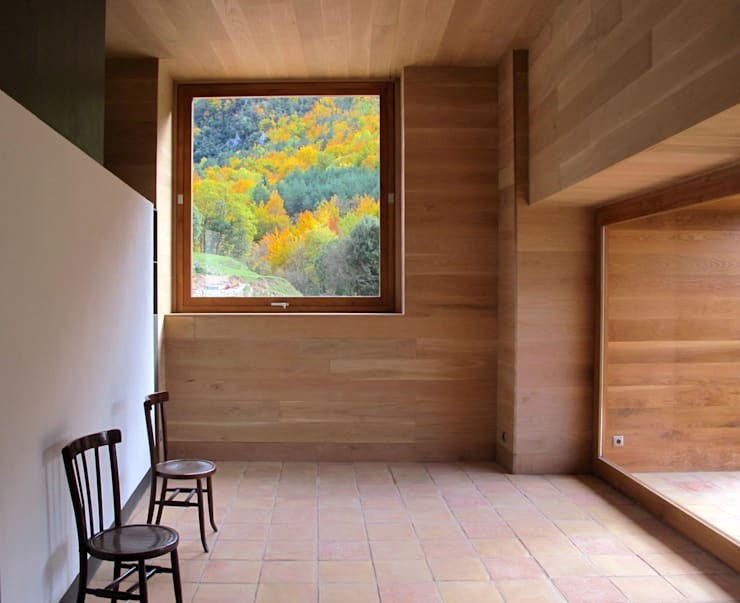 Small, terracotta tiles line the floor, perfectly matching the tone of the wooden decor, while plenty of windows have been included to light the living spaces, and to provide the occupants with a range of stunning views of their mountainous surrounds. In addition to the flowing timber constructing the decor, the designers have included a range of timber furnishings to complement the style and tone of the home's interior. A kitchen alcove in pale wood has been constructed, providing an unique space in which to cook up a hearty, country meal, while a lengthy banquet table borders the kitchen, waiting to accommodate a lively feast should the occasion arise. The views from this home are truly inspiring, with colour and light flowing through its array of windows from all angles. The designers have clearly sought to capitalise on the home's locale atop a hillside, by including multitude spaces to quietly admire its far-reaching vista. Aside from its generous array of windows, this home also benefits from a secluded balcony and expansive deck. 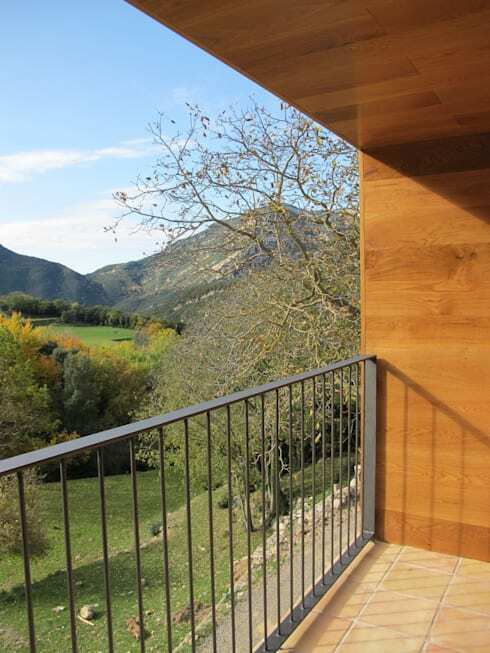 The balcony, pictured here, provides a gorgeous space in which to enjoy some solitude in front of the home's stunning scenery, with the rolling, green hills and mountains beyond sure to soothe a busy mind with the beauty of nature. 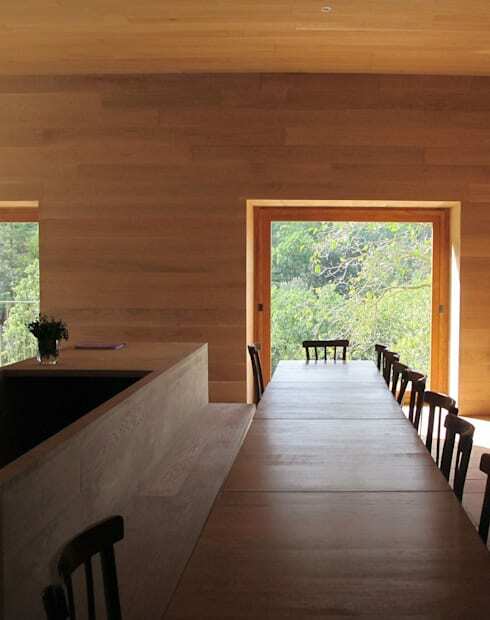 A final view of this amazing home reveals the extent of its stunning locale. The abode is nestled amidst plenty of hillside greenery, with the softness of nature offsetting the rough texture of its rocky facade. The home's stone foundations flow down the hillside, emitting an air of history and creating a series of linear garden beds for the owners to tend. Truly this dwelling is a special one, and stands ready to grace its green hillside for many years to come. If you enjoyed the stone construction of this wonderful home, you should take a tour of The Incredible Island of Wood and Stone for more design inspiration! What kind of furnishings would you use to decorate the interior of this amazing home? Tell us your ideas below!